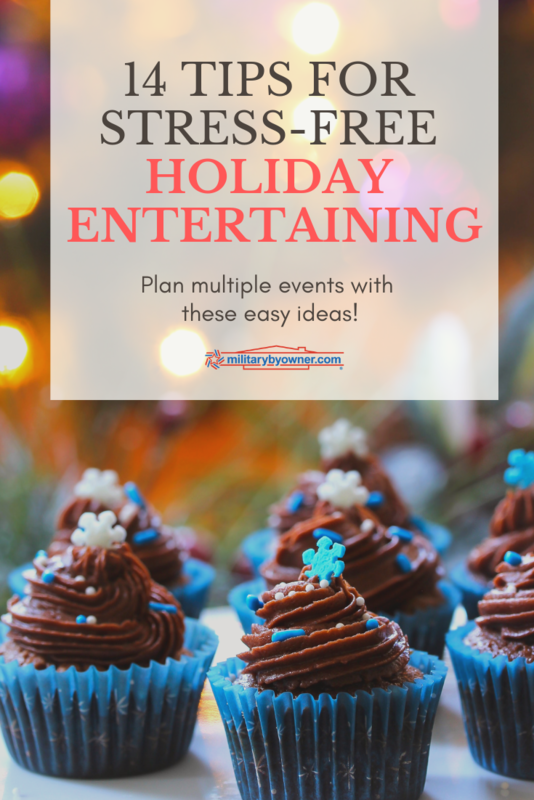 Planning for multiple entertaining events over the holidays requires some forethought, but if done well, you can strategize once for 2-3 separate parties. Although the basics will be similar, tweaking the presentation and adding festive details individualizes the separate parities enough that if there happen to be repeat guests, they’ll be impressed with each. Let’s face it, sometimes we have to host obligatory parties, especially during active duty service. Although these can be fun, they’re just different than having a party devoted to friends. To pull off these two types of events, consider an open house style party for work friends and then later, a dessert party for your closest friends and family. Depending on your calendar, proposing the two events within about a week’s time is ideal to preserve any pre-made food and decorating arrangements that are fresh. 1) When planning for both types of parties, it is easier to incorporate a theme, such as “Christmas Around the World” to tie them together. Finding appetizers and desserts to fit this theme is perfect during the holiday months because so many of us like to indulge in international treats. 2) An evening dessert party is straightforward to prepare for and a bit unexpected for guests. 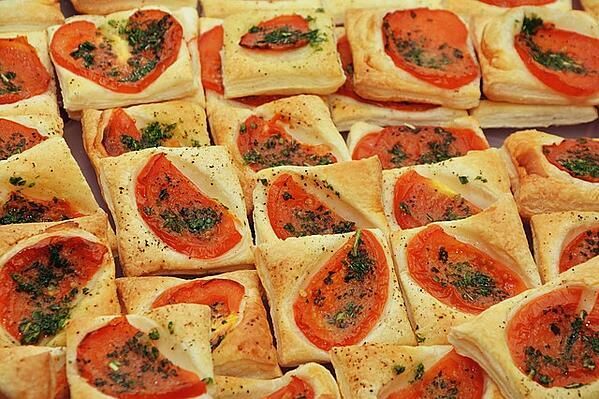 Most think of an evening out as heavy hors d'oeuvres or possible meal. But by clearly mentioning that the gathering will provide an “Arrangement of Holiday Desserts” on the invitation, they’ll get the hint to eat dinner before coming. 3) A Saturday or Sunday afternoon drop-in, scheduled from 1-5 pm is an excellent way to host a large group of people who may want to come say hello and enjoy an array of appetizers and a glass of wine, but aren’t comfortable devoting an entire evening to office mates, subordinates, and superiors. Guests will mingle for as long as they wish, but won’t feel obligated to stay the entire afternoon. A constant rotation of people means fresh rounds of small talk and new introductions which allows conversation to flow. Because the open house will require more food and overall preparation, it's best to start with planning that menu and drink selection, but keep the dessert party in the back of your mind to find recipes or store-bought items that pull double duty. Here are a few time-tested tips. 4) For ease and overall time saving, go with industry standards or with dishes you already know how to prepare. Quick and easy entertaining does not include complicated (translation: expensive) food selections. Head over to Pinterest and type in “two or three ingredient appetizers” and just try to sort through the best ones! 5) Hundreds of easy and cost effective offerings will pop up, but don’t be surprised to see many of them include bacon! Most everyone loves bacon in some form; chocolate covered, skewered, and wrapped; bacon performs the heavy appetizer lifting. 6) Don’t worry about your vegan guests, you’ll plan for them later. Just remember, most everything, especially vegetables, can be artfully arranged in a flat Christmas tree shape on a serving tray. 7) Another trick for simple entertaining is to use the trusted brands you already swear by as a reference. Use their websites to search for recipes. Did you know there are literally hundreds of ways to serve Triscuits? The creative process is completed for you, so take advantage of someone else’s idea. Plus, there’s likely downloadable coupons. 8) If you prefer a bit more party preparation, stick with the pros and read over their holiday entertaining sections online. Don’t re-invent the wheel; Martha, Rachael, and Ina already perfected everything you’ll need. 9) For a well-attended open house, you’ll likely do well to offer about 5-7 different heavy appetizers, to include a vegetarian and a grain-free option. Also plan for 2-3 dessert options and remember to choose desserts wisely, with the intention to prepare extras for the upcoming dessert party. 10) Remember there is no shame in calling in the professionals to handle catering needs. It’s a disservice to automatically dismiss this option due to cost. Big name stores, grocery and specialty have the means to provide food for dozens much faster and easier than most once-in-awhile hosts. Is $50 more than you planned to spend enough to save some sanity in the kitchen? 11) Dessert parties are relaxed and easy to prepare for. 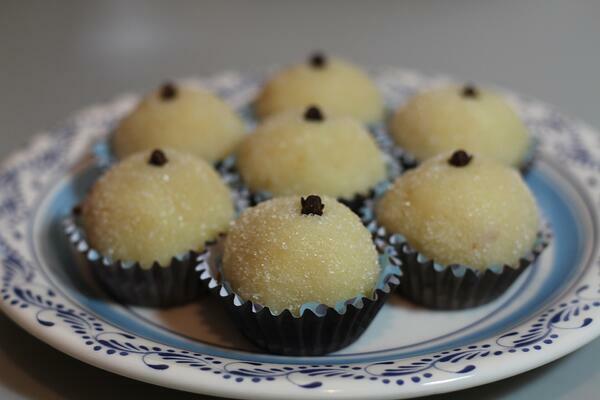 Many of the best sweets can be made in advance and frozen. Because you can serve some of the cookies or cakes at your open house, doubling batches early on takes away some of the burden. Professional bakers and specialty shops crank out delectable items much faster and without the worry of burned cookie bottoms. 13) If preparing food for your parties makes you happy you wouldn’t dream of hiring out, would housekeeping before and after the events save time and energy? How about a bartender to keep the cocktails flowing? Depending on your guest list, a legally aged college kid could handle a few beer and wine options. If the party is more sophisticated, a pro bartender lifts a lot of hosting burden. 14) Holiday entertaining at its best is flexible and accommodating of guests, but it can also be fun for the host if you plan according to your budget and timeline. To manage multiple events, choose foods and themes that you are familiar with and already own the serve ware and decorating items to support the event. The addition of a few on trend food or drink offerings provides the extra details that customize each party. Keep MilitaryByOwner in mind for more information about hosting, guests, and entertaining, because a constant in military life includes welcoming family and friends whenever possible, especially during the holiday season.